This book is about what we are at risk of losing forever- the vanishing beauty of the habitats and exotic animal species of east and west Africa. We all have a responsibility to look after our world, before it is too late. Hope for these species lies with us. We walk the same paths as the animals. We breathe the same air. In the Book of Genesis Noah’s Ark, ensures the survival of animal species from The Great Flood. It is this ancient Ark for which we are all still responsible. The animals do not have a voice, but we certainly do. 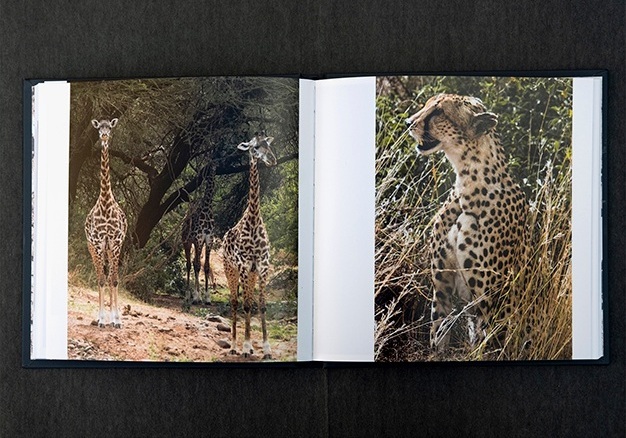 This book is about what we are at risk of losing forever⏤the vanishing beauty of the habitats and iconic animal species of east and west Africa. 10% of the proceeds from pre-order sales on this website will go towards funding the education of wildlife warriors - safari guides training at Prots School in Tanzania. Hardcover with black linen cloth, dust jacket, over 60 beautifully printed colour images, large format 22cm x 22cm, with Catherine’s personal travel journal essays and hand-drawn maps, worldwide shipping available. P.O.A. In this book Catherine’s meeting with a Tanzanian, Emmanueli, on the slopes of Mt Kilimanjaro last year led to a story of her fundraising to help him fulfil his aspirations for an education. This publication is her way to contribute to the ongoing efforts of the African people to protect their wildlife and ensure its survival. We all have a responsibility to save endangered species from extinction before it becomes an apocalypse now.